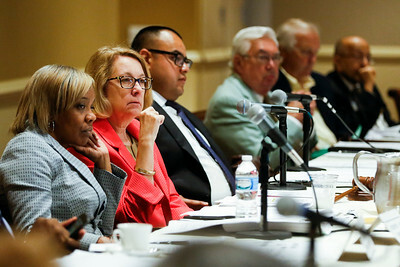 Sarah Nader - snader@shawmedia.com Board members listen to speakers during a Health Facilities and Service Review Board hearing for the Mercy hospital that plans to build in Crystal Lake Tuesday, June 20, 2017 in Bolingbrook. There were presentations of support and opposition while the board members determined how to decide on this $80 million facility. 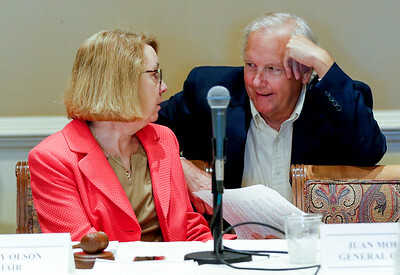 Sarah Nader - snader@shawmedia.com Kathy Olson (left), chairman of the Illinois Health Facilities and Services Review Board talks with board member senator Brad Burzynski before a Health Facilities and Service Review Board hearing for the Mercy hospital that plans to build in Crystal Lake Tuesday, June 20, 2017 in Bolingbrook. There were presentations of support and opposition while the board members determined how to decide on this $80 million facility. 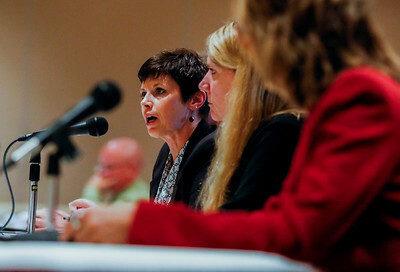 Sarah Nader - snader@shawmedia.com Mercyhealth Vice President Jeni Hallatt makes a statement at the Health Facilities and Service Review Board hearing for the Mercy hospital that plans to build in Crystal Lake Tuesday, June 20, 2017 in Bolingbrook. There were presentations of support and opposition while the board members determined how to decide on this $80 million facility. 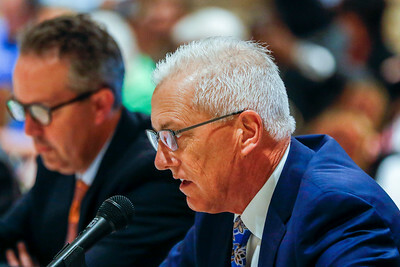 Sarah Nader - snader@shawmedia.com Centegra Health System CEO Mike Easley makes a statement at the Health Facilities and Service Review Board hearing for the Mercy hospital that plans to build in Crystal Lake Tuesday, June 20, 2017 in Bolingbrook. 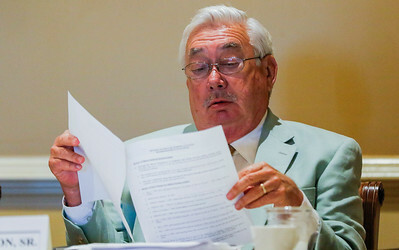 There were presentations of support and opposition while the board members determined how to decide on this $80 million facility. Sarah Nader - snader@shawmedia.com Crystal Lake Mayor Aaron Shepley makes a statement at the Health Facilities and Service Review Board hearing for the Mercy hospital that plans to build in Crystal Lake Tuesday, June 20, 2017 in Bolingbrook. There were presentations of support and opposition while the board members determined how to decide on this $80 million facility. 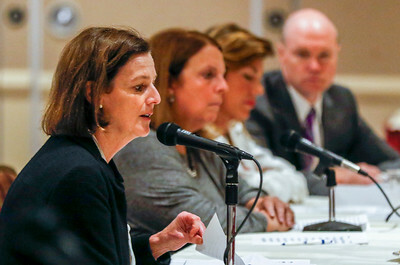 Sarah Nader - snader@shawmedia.com President of Advocate Good Shepherd Hospital Karen Lambert makes a statement at the Health Facilities and Service Review Board hearing for the Mercy hospital that plans to build in Crystal Lake Tuesday, June 20, 2017 in Bolingbrook. There were presentations of support and opposition while the board members determined how to decide on this $80 million facility. 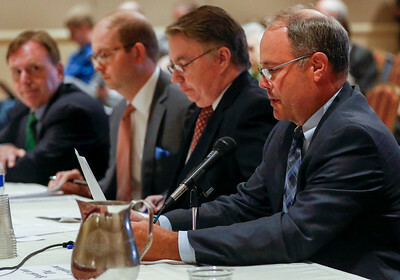 Sarah Nader - snader@shawmedia.com Board member John McGlasson listens to speakers during a Health Facilities and Service Review Board hearing for the Mercy hospital that plans to build in Crystal Lake Tuesday, June 20, 2017 in Bolingbrook. There were presentations of support and opposition while the board members determined how to decide on this $80 million facility. 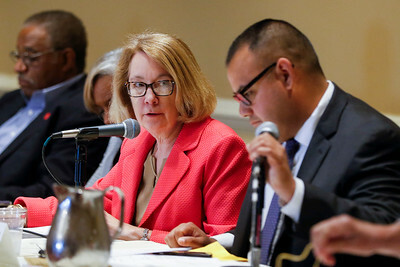 Sarah Nader - snader@shawmedia.com Kathy Olson (center), chairman of the Illinois Health Facilities and Services Review Board listens to speakers during a Health Facilities and Service Review Board hearing for the Mercy hospital that plans to build in Crystal Lake Tuesday, June 20, 2017 in Bolingbrook. There were presentations of support and opposition while the board members determined how to decide on this $80 million facility. 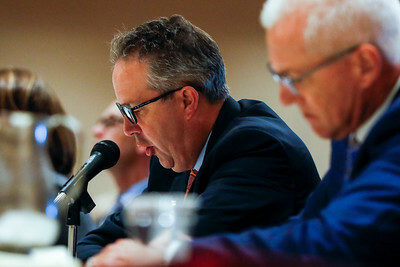 Sarah Nader - snader@shawmedia.com System Vice President and COO MercyCare Patrick Cranley makes a statement at the Health Facilities and Service Review Board hearing for the Mercy hospital that plans to build in Crystal Lake Tuesday, June 20, 2017 in Bolingbrook. There were presentations of support and opposition while the board members determined how to decide on this $80 million facility. 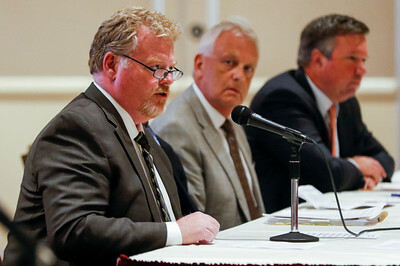 Crystal Lake Mayor Aaron Shepley makes a statement at the Health Facilities and Service Review Board hearing for the Mercy hospital that plans to build in Crystal Lake Tuesday, June 20, 2017 in Bolingbrook. There were presentations of support and opposition while the board members determined how to decide on this $80 million facility.